ჯეფრი ჯეიკობ აბრამსი (ინგლ. Jeffrey Jacob Abrams, აგრეთვე ცნობილი როგორც ჯეი ჯეი აბრამსი, ინგლ. 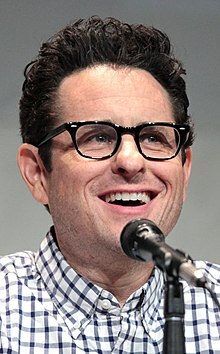 J. J. Abrams, დ. 27 ივნისი, 1966) — ამერიკელი სცენარისტი, პროდიუსერი და რეჟისორი. ამჟამად ცხოვრობს ლოს-ანჯელესში. ↑ CW Picks Up 3 More Drama Pilots Including JJ Abrams & Mark Schwahn's Shelter. Deadline.com. Retrieved February 24, 2012. ↑ Andreeva, Nellie. Andrew J. West To Play The Lead In CW Pilot 'Dead People' From Bad Robot. წაკითხვის თარიღი: November 25, 2015. ↑ Hulu Original "11.22.63" Premieres Presidents Day 2016. The Futon Critic (October 30, 2015). წაკითხვის თარიღი: November 25, 2015. ↑ Gerard, Jeremy. (August 9, 2015) ‘Westworld’ First Trailer: HBO Teases Series With Anthony Hopkins, Ed Harris. Deadline.com. წაკითხვის თარიღი: November 25, 2015. ↑ “Showtime Gives Series Pickup to Cameron Crowe-J.J. Abrams Comedy ‘Roadies’“, Variety, October 14, 2015. წაკითხვის თარიღი: November 25, 2015.
ეს გვერდი ბოლოს დარედაქტირდა: 22:36, 9 სექტემბერი 2018.